Environmental chambers are a critical aspect of any pharmaceutical company. Their contents are the lifeblood of the industry—data being collected for submission to the FDA—so when an environmental chamber fails, getting it back up and running is a high priority. Environmental chambers regulate heat with temperature coils and refrigeration units, and humidity by converting a supplied water source into steam and then removing excess moisture with condenser coils. Environmental chambers are constantly adjusting to maintain set points and, in most cases, handle and consume significant quantities of water for humidity generation purposes. 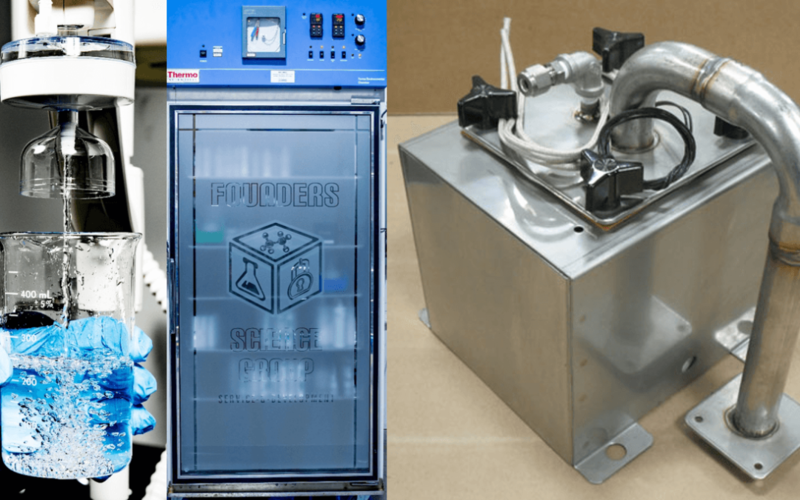 When issues arise with an environmental chamber, bringing in an external company to troubleshoot and repair the equipment can be costly and time consuming; below, we share with you a number of failures and potential causes and fixes. The steps in each section progress from failures that are more likely and/or easiest to fix to the more complex/expensive fixes. Prior to embarking on any of these solutions, confirm that the appropriate functions are activated; where applicable, confirm that the humidity switch is on, the dehumidify switch is on, the refrigeration switch is on, and any other main functions that have a binary switch. The humidity control system plays a critical role in environmental chambers and has a tendency to be the more likely failure point when compared to temperature control. Whenever you are troubleshooting or considering preventative maintenance, understanding the impact of the set point conditions on your unit is a good place to start.. A unit set at 75%RH will have much higher water intake requirements than a chamber at 15%RH, and therefore the humidity generation system will be performing more work and processing more water at the higher humidity set point; higher usage rates mechanical failures along the humidity generation pathway. Another consideration for any humidity failure is the source water. Make sure you are providing your chambers with the appropriate quality source water as directed by the equipment manual (see our Tips for Cleaning section for more information). Humidity Exceeding Set Point: High humidity is usually caused by delivering too much heat to the steam generator, not enough water to the steam generator, or a mechanical failure. Check the flow of water to the steam generator. Most humidification systems have a solenoid valve, float switch or some other mechanical device controlling the entry of water into the steam generator. If this control point fails, or if the water flow into the chamber becomes obstructed by contaminants, this will reduce the amount of water entering the steam generator, allowing the heating band to heat up to temperatures exceeding that which it normally delivers, creating excess steam. mFailure to correct this can also lead to mechanical failure of the thermal fuse associated with the heater or burning out of the heater itself. Check the relays delivering the “lower” humidity signal from the controller. In some cases, a mechanical relay will fail, cutting off the signal from the controller that directs the unit to reduce the humidity inside the chamber. Humidity Below Set Point : Low humidity is usually caused by a mechanical failure or by improper setup of the of the source water connection into the steam generator. Confirm that the steam generator’s heater is operating properly. In most cases there is a thermal fuse associated with the steam generator’s heater (see Figure 1). These are usually an easy and inexpensive fix. If there is no issue with the fuse, contact the manufacturer to see what the resistivity should be across the heater. Over time the heaters will fail and changes in the resistivity are a good way to evaluate whether the heater itself is the problem or not. Confirm that there is not a failure in the float switch. If the float switch is constantly calling for water it may be reducing the temperature of the steam generator by introducing cool, source water, into the steam generator system such that it cannot provide appropriate levels of humidity based on the set point. Confirm there are no places along the humidity pathway that may be leaking. If there are any loose fittings or unsealed ports, humidity can be escaping the unit, which could prevent the unit from generating enough steam to keep up with the humidity set point. Ensure that there is an appropriate live load and/or there is nothing blocking the proper flow of air into/through the chamber. All chambers are designed to handle a certain amount of mass/volume of material. Ensure that the contents within the chamber do not exceed the manufacturer’s recommendations. Additionally, if air circulation is not occurring properly, especially in the area of the controller’s probe, this can throw off the ability of the unit to evaluate and/or generate the appropriate humidity. Failure of the unit’s fan can also prevent the proper circulation of air. Check the relays delivering the “increase” humidity signal from the controller. In some cases, a mechanical relay will fail, cutting off the signal from the controller that directs the unit to increase the humidity inside the chamber. The user manual should contain electrical schematics that can help you identify what relays are associated with each mechanical action/part. Temperature Above Set Point: High temperature is usually caused by a mechanical failure. We suggest that the temperature function be disabled until a fix can be identified as excess temperatures are the most likely to cause significant damage to the unit and/or contents. If the temperature switch on the unit does not disable the heat generation, it is recommended that the temperature controller is disconnected. Check the relays delivering the “decrease” temperature signal from the controller. In some cases, a mechanical relay will fail, cutting off the signal from the controller that directs the unit to reduce the temperature inside the chamber. Check the air heaters for any failures. Contact the manufacturer to determine appropriate voltage to or resistivity across the unit’s air heaters and make sure that the heaters are operating properly. Check the temperature controller for failure. A failure in the temperature controller could be sending the “increase” signal to the chamber. Take note of the appropriate indicator lights if present. For example, on a Thermo Scientific 3940 unit, there is an indicator on the chamber that lights up to signify the various actions (i.e. heat, cool, humidify, dehumidify). On the associated controller there are indicator lights for each output. In most cases, output 1 is an “increase” output, and output 2 is a “decrease” output (refer to the equipment manual to learn how to navigate the various menus and confirm the associated inputs). The “Heat” indicator light on the chamber should flash in unison with the indicator for the appropriate “increase” output (normally output 1) on the temperature controller. Discrepancies in the timing of the chamber indicator and the controller indicator may indicate an issue with the controller. In some cases, swapping in a spare controller can be done quickly, which is a simple way to identify if the controller is operating properly or not. Check the refrigeration unit. If all of the above are in working order then there could be a failure in the refrigeration unit which is intended to remove heat from the environmental chamber. Temperature Below Set Point: Low temperature is usually caused by mechanical failure. Check the relays delivering the “increase” temperature signal from the controller. In some cases, a mechanical relay will fail, cutting off the signal from the controller that directs the unit to reduce the humidity inside the chamber. Check the air heaters for any failures. Contact the manufacturer to determine appropriate voltage to or resistivity across the unit’s air heaters and make sure that the heaters are operating properly. The wirewound heaters on the Thermo Scientific 3940 have two thermal fuses associated with them, which may need to be replaced, see Figure 2. Check the temperature controller for failure. A failure in the temperature controller could be sending the “increase” signal to the chamber. Take note of the appropriate indicator lights if present. For example, on a Thermo Scientific 3940 unit, the “Cool” indicator light should light up in time with the indicator for the appropriate output for cooling on the temperature controller. Discrepancies in the timing here may indicate an issue with the controller. In some cases, swapping in a spare controller can be done easily and with little effort, which is simple way to identify if the controller is operating properly or not. Inconsistent set-point control is usually correlated with two things: a potential indication of mechanical failure or, for units not utilizing on/off control, improper Proportional Band, Integral and/or Derivative settings (also known as PID control, which is explained in the next section) . If a change in control occurs suddenly, it is likely an indicator of a mechanical failure as opposed to an issue with the PID settings. Many controllers, like the Watlow EZ-Zone series, come with a self-tuning feature. If you are having issues maintaining a set-point, refer to the manufacturer’s manual and identify if it has a self-tuning feature (in Watlow’s case the feature is called TrueTune+). If you are not comfortable with manual programming of the PID settings (see the next paragraph), you can run the self-tuning program and see if this addresses the issue. In our experience, manual adjustments of the PID settings have had more success than the automatic tuning features but not everyone is comfortable with making PID adjustments themselves. You can always take note of the PID settings, run the self-tune, and if you do not like how the equipment is behaving after the self-tuning, you can return the PID settings to where they were previously. PID control is split up into three parts. The Proportional Band (P), the Integral (I) and the Derivative (D). The Proportional Band determines % output of the function based on the magnitude of the difference between the set point and the current value. In the case of the Watlow EZ-Zone series, the Proportional Band sets the value of the difference which will cause the unit to provide 100% power to the output, so a value of 1 means that the controller will deliver 100% output whenever the difference between the set point and the current value is greater than 1. The proportional band can address issues where the unit is over-shooting and under-shooting the set point, but if the control is close to the set point, the integral and derivative are better for fine-tuning any oscillations. The Integral ramps the % output, in conjunction with the Proportional Band, as a function of time. The longer the unit has deviated from the set point, the more power the controller will direct to the output. Adjustments to the integral value will change how quickly/slowly the controller ramps the power up as a function of time. Refer to your controller’s manual to determine how changes to the integral value change the ramping power. If the unit is taking too long to approach the set point from either side, adjustments to the integral can increase the rate at which the unit achieves the set point. However, this can increase the tendency of the unit to oscillate around the set point, leading to too much undershoot/overshoot. The Derivative ramps the % output, along with the Proportional Band and the Integral, as a function of the change in the deviation from the set point. That is, the less there is a change in the deviation from the set point (i.e. the more the unit is resisting the change in value) the more the % output is ramped up. Adjustments to the derivative can reduce the % output as the value approaches the set point, thus smoothing out oscillations caused by the Integral function. Take note of how well your unit is maintaining set point. If blips begin to show up in the control process that were not present before, see if there is an attributable cause. If there isn’t, consider the process/condition that was impacted and be certain that spare parts are on hand. If possible, open the unit up and check the appropriate mechanicals (e.g. if there is a previously unseen blip that begins appearing regularly on the temperature control, power off the unit and check the air heaters to make sure that the heaters are not beginning to fail). A good example for us was, a few years ago we had an environmental chamber that began to show some blips in the humidity control. Eventually the circulation fan seized up and needed to be replaced—those blips were moments when the fan was “partially” failing—seizing up for a few minutes before restarting. Be aware of how your unit is consuming resources. If your chamber begins to consume more water than it normally does, or begins to drain out less water than it normally does, take note of the humidity pathway and determine if it is worth it to check any of the mechanicals for proper operation, as this can be a sign that there is something wrong with the unit. An example for us was that we had a chamber that started gobbling up water. This occurred along the same time we had made an increase to the humidity set point which masked the true issue—the stainless steel pot for the steam generator had a minor leak in it, which was leaking into a sealed compartment causing corrosion to start to spread throughout the unit, with the end result being that a number of parts needed to be replaced. Only clean the humidity generation system with non-rusting metals. As part of our standard maintenance we evaluate and, if needed, clean the humidity generation system as it is prone to corrosion/excess mineral build-up. If physical removal of any corrosion or mineral accumulation is needed, use a brass brush and not stainless steel brush or steel wool as those can leave behind metal fibers that will rust out, increasing the likely hood of future corrosion or mineral build up. Do not use chlorinated solvents. Chlorinated solvents can impact the passivation of stainless steel which will make it more susceptible to rusting. Confirm proper source water. All chambers will have a purity requirement on incoming water. If the water is too impure it can leave behind minerals. If the water is too pure it can begin to corrode stainless steel. Each unit may vary but a source of water that is between 1µS/cm to 20µS/cm seems to be standard (equivalent to resistivity of 1,000,000 ohms to 50,000 ohms).